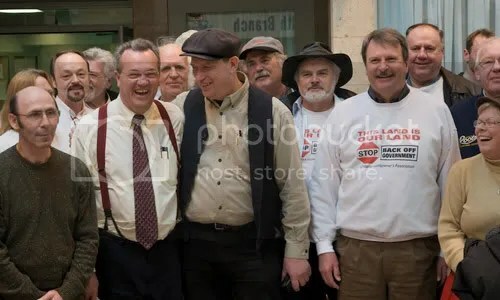 Raw milk farmer Michael Schmidt outside the courtroom in Newmarket with supporters Randy Hillier on his right and ex-Landowner Association president Jack McLaren on his left. Jack’s Landowner Association colleague at Queen’s Park, Randy Hillier, has been an outspoken supporter of raw milk legalization, even putting forth a private members’ bill to that effect. Liberal pundits have taken note of what they see as an alarming trend towards what they’re calling extremism within the provincial Progressive Conservative party, which they say the increasing influence and presence of the Landowner candidates is an indication of. “Norm Sterling, a veteran Progressive Conservative MPP and former cabinet minister, has been bounced as an Ottawa-area candidate for his party in Ontario’s fall election. 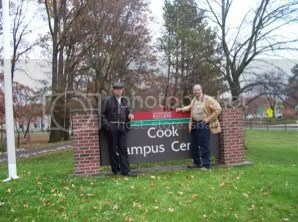 Michael Schmidt and Joseph Heckman at Rutgers University a few months ago. Photo via The Complete Patient blog. “I have long felt that one of the keys to breaking through the regulatory roadblocks to easily accessing nutrient-dense foods like raw dairy is for farmers to flood the market with products the regulators want to keep from us. For that to happen, though, there need to be enough farmers willing to make the commitment and take the risks.